Despite concerns that the 2018 tax reform law would undermine housing values, Westchester and the Hudson Valley held steady in the third quarter, with prices rising throughout the region and up dramatically in some counties. Some analysts have expressed concerns about the effects of the 2018 Tax Reform law on our regional housing market. The tax law capped the deductibility of state and local taxes and reduced the mortgage interest deduction, which particularly impacts high‑tax areas, like Westchester and the Hudson Valley. Indeed, those analysts might see evidence for this theory in the third-quarter results, with regional single‑family home sales falling almost 2% from last year, and down in almost every individual county. 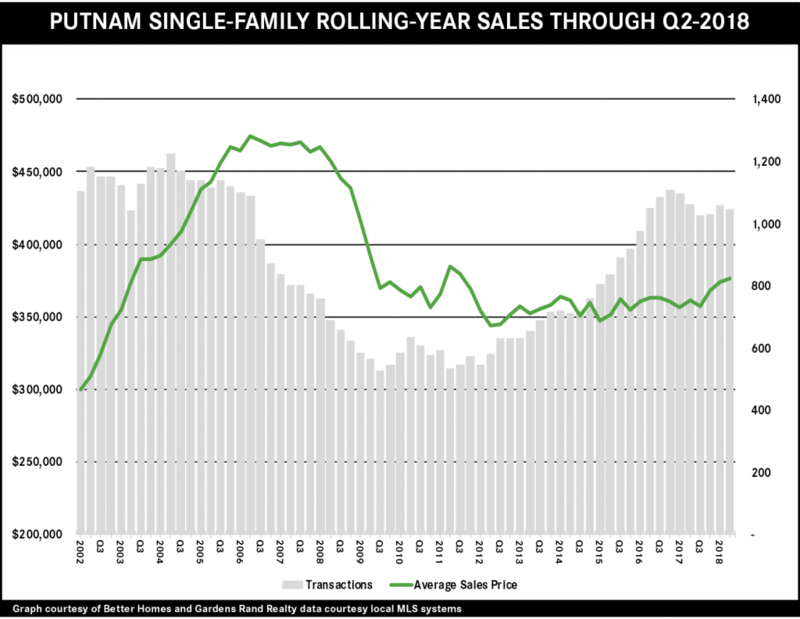 First, this trend of declining sales predates tax reform. We’ve been tracking falling sales for almost two years, with regional sales down, in five out of the last six quarters, well before the passage of tax reform in late 2017. Second, sales are down in all markets, not just high‑priced markets. Tax reform would not explain why sales are down even in the lower‑priced markets, where most buyers do not itemize taxes in a way that they’d be affected by changes in deductibility. And yet, quarterly sales were down more in Rockland and Dutchess than they were in Westchester. Third, prices are up in almost every market segment. Regional average sales prices were up almost 3% for houses and 5% for condos in the third quarter and were up (in some cases dramatically) in every individual county for almost every property type. If tax reform had sapped demand in the market, we’d be seeing flat or declining pricing, not robust appreciation. All that said, tax reform might be having a small impact on the very high end of the market, where the loss of deductibility for mortgage interest and local taxes hits the hardest. 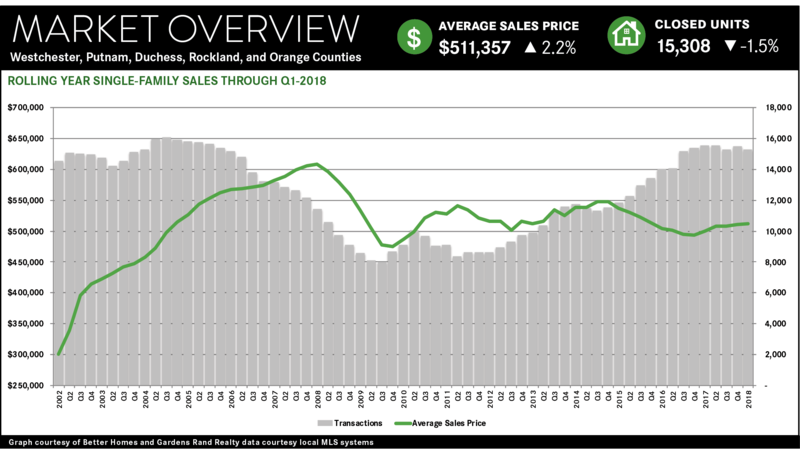 Price appreciation was more pronounced in the lower‑priced markets, with single‑family average prices rising 11% in Putnam, 6% in Rockland, 14% in Orange, and 7% in Dutchess. Meanwhile, Westchester’s single‑family home pricing was up just a tick on average, and only fell 1% at the median. We’re talking about a marginal, not a major, impact. Prices aren’t rising at the rate they are in the lower‑priced markets, they’re basically flat, not falling. Moreover, inventory is starting to respond to these rising prices. For the first time since 2012, inventory levels went up this quarter, which illustrates fundamental economic market theory: If demand is strong, and supply stays steady (or goes down), prices will go up. And when prices go up, new inventory will come onto the market. That’s what we’re seeing now: After years of decline, single‑family inventory was up in almost every county in the region, stabilizing near that six‑month level that usually signals a balancing market. Going forward, we believe that the appetite in the market can handle both the impact of tax reform and this increased inventory while still driving continued price appreciation. With strong economic conditions, relatively low‑interest rates (and the specter of rate increases on the horizon), and pricing still at attractive 2004‑05 levels, we expect a robust market through the end of the year. Low levels of inventory in Putnam continued to stifle sales in the second quarter, even while pushing prices up to post‑correction highs. Sales of houses were down over 4% for the quarter, and now down almost 2% for the year, reflecting the lack of available supply on the market. But high levels of demand, coupled with that low inventory, continued to drive price appreciation, with house prices now up over 4% on average and almost 5% at the median for the rolling year. The condo market was even more robust, with sales and prices up sharply. Going forward, we believe that inventory will stabilize as sellers come into the market to take advantage of rising prices, but that we will continue to see strong sales and rising prices at least through the end of the year. The regional housing market in the New York City northern suburbs surged again in the second quarter of 2018, with high demand and low supply driving prices up throughout the area. Sales are down. 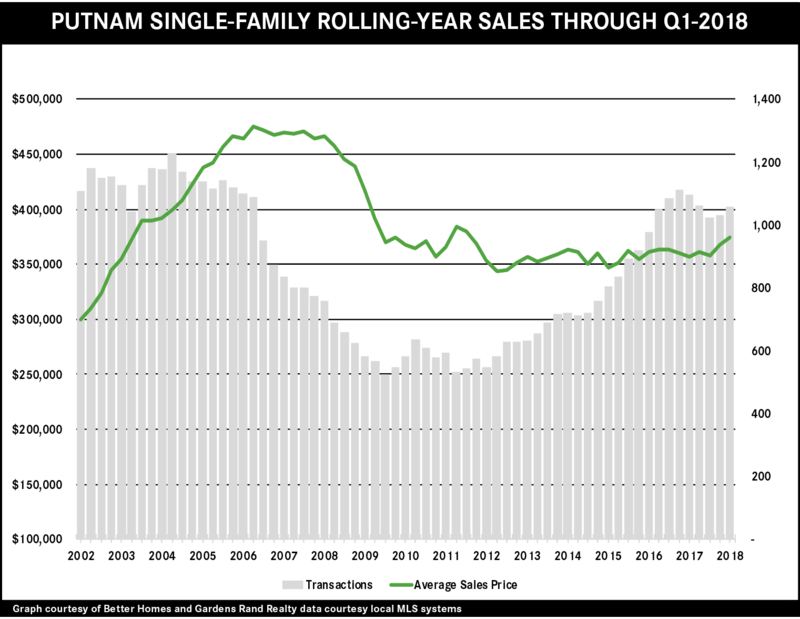 Regional single‑family home sales in the quarter fell almost 3%, and condo sales fell 7%, continuing a trend we’ve been watching for the past year ‑‑ indeed, the rolling-year sales were down about 2% for all property types. To put this in perspective, rolling-year sales had gone up in 24 out of the last 25 quarters prior to the first quarter of this year. And the decline is universal, with single‑family sales down in virtually every county in the region: falling almost 5% in Westchester, 4% in Putnam, and 10% in Rockland (sales rose slightly in Orange and Dutchess). Prices are up. But all this demand, coupled with a lack of supply, is having its expected impact on pricing. Single‑family average prices were up across the board, rising over 3% for the region and up in every county in the region: up over 2% in Westchester, almost 3% in Putnam, over 8% in Rockland, almost 11% in Orange, and over 10% in Dutchess. And for the first time in over 10 years, single‑family average prices for the rolling year were up in every county in the region. 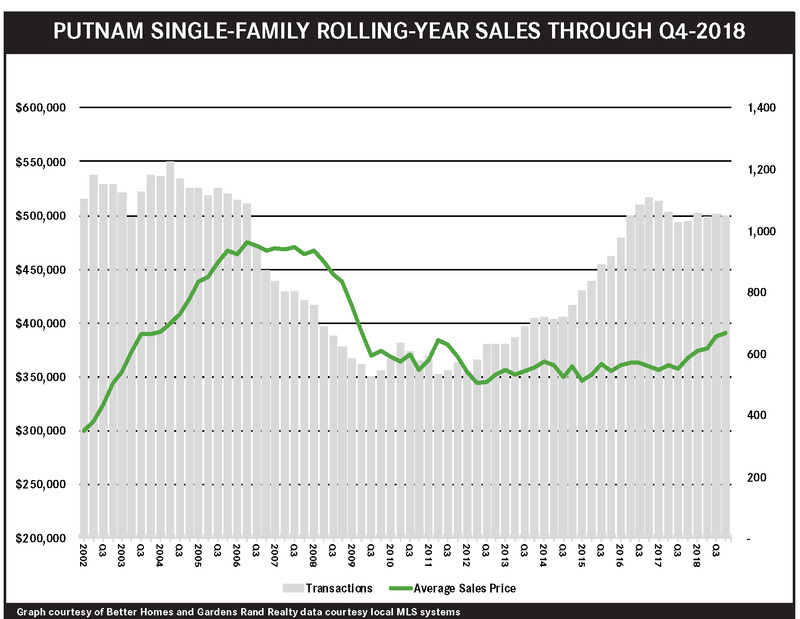 Inventory is low, but is starting to rise. The key to this market, of course, is the amount of available supply: the number of homes for sale in the market. 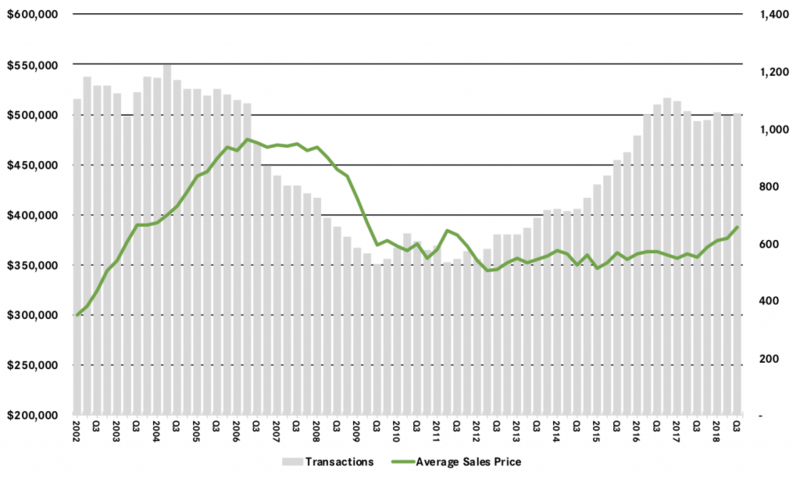 Inventory has been falling for several years now, holding back sales and driving prices up. But that same economics textbook teaches us that as prices go up, eventually supply starts to rise. Why? Because rising prices attract sellers into the market. 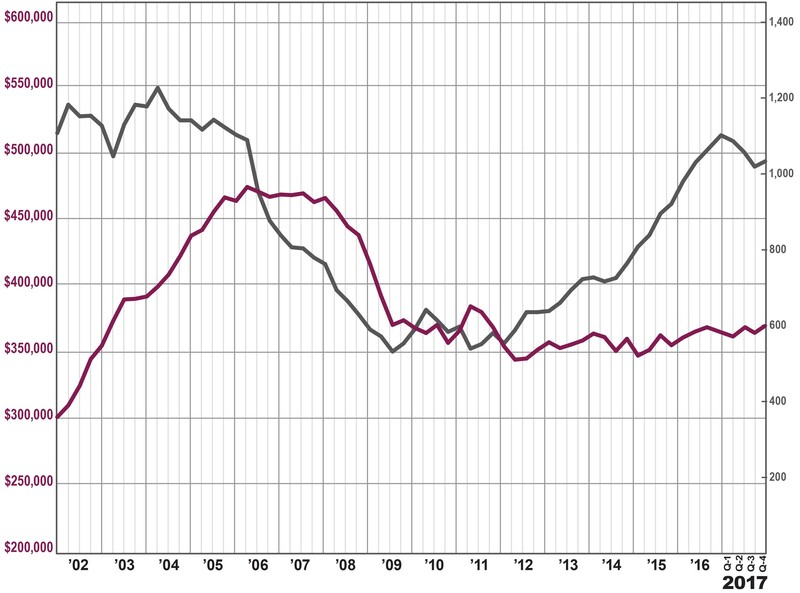 And that is exactly what we’re starting to see: stabilizing inventory. Inventory is still low, but it’s starting to settle at about the six‑month level that signals a balanced market. Indeed, the months of inventory in the region was at 6.2 months, flat compared to the second quarter of last year. And inventory was actually up in both Westchester and Rockland. It might be too early to call a shift in the market, but this was a noticeable change after several years of sharp inventory declines quarter after quarter. Going forward, we expect the market to continue to grow through 2018. The seller’s market is really just starting to hit its stride, where high demand meets higher supply and pushes both sales and prices up over last year. Higher prices might be tempting more sellers into the market, but we believe that demand is strong enough to accommodate this supply, and drive price appreciation through the end of the year. NANUET, NY – In what continues to be Better Homes and Gardens Rand Realty’s further expansion throughout Westchester County, New York, they’re excited to announce that AXRE, Corp. of White Plains has merged with their company. Stanovic has been involved with real estate since 2007, finding success in managing residential and commercial properties throughout New York and Connecticut, and he continues to do so today. He holds a broker’s license. Stanovic opened AXRE, Corp. in July 2016. Their brokerage served New York City, Westchester County, Putnam County, and from Greenwich to New Haven in Connecticut. For the transition to Rand Realty, Stanovic brings his team of eight dedicated salespeople, who will be working out of Rand Realty’s branch in White Plains, while Nik will be working as the new manager at Rand’s branch in the Bronx. Better Homes and Gardens Rand Realty, founded in 1984, is the No. 1 real estate brokerage firm in the Greater Hudson Valley, with 28 offices serving Westchester, Rockland, Orange, Putnam, and Dutchess Counties in New York, as well as Bergen, Passaic, and Morris Counties in New Jersey. The housing market in the New York City northern suburbs of Westchester and the Hudson Valley has become a fully‑realized seller’s market, with declining inventory stifling sales growth while driving meaningful price appreciation throughout the region. The regional market continues to suffer from a lack of inventory. The number of homes available for sale compared to last year fell sharply in every market in the region. At the current absorption rate, we are now down to well under five months of inventory in every county for single‑family homes, and down to under four months for the lower‑priced condo market. That’s significantly below the six‑month level that usually denotes a seller’s market. This lack of inventory is holding back sales. Regional transactions were down over 6% from last year’s first quarter, and were down in every county except Putnam: falling 6% in Westchester, 19% in Rockland, 0.3% in Orange, and 13% in Dutchess. For the rolling year, the drop was more moderate, with sales down just 1.5% regionally. But this isn’t a demand problem—demand is strong everywhere in the region. But with all this demand chasing fewer homes, prices are up significantly across the region. The average sales price was up for every county and property type except for Westchester single‑family homes and condos, which might be a reflection of stronger demand at more entry‑level price points. 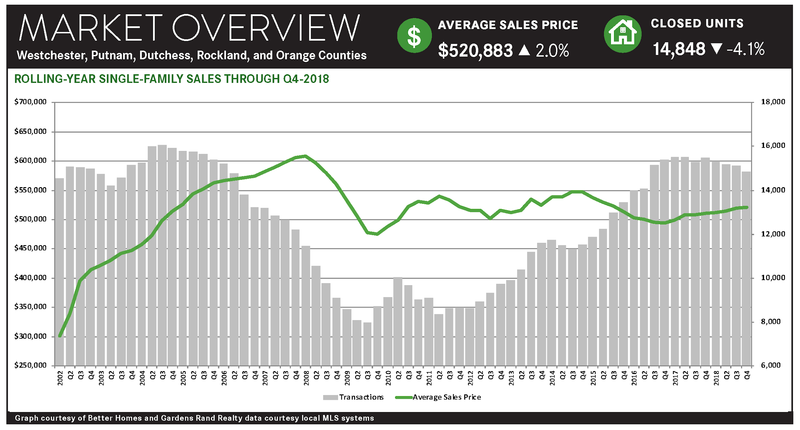 The longer‑term trend, though, indicates that prices are generally appreciating at a moderate but meaningful rate, with the rolling-year average sales price for single‑family homes up over 2% for the region, and up in each county: rising 3% in Westchester, 5% in Putnam, 4% in Rockland, 4% in Orange, and 5% in Dutchess.